Kyrathaba Rising is a new take on alien/post apocalyptical fiction. The earth has been devastated by an alien attack, leaving perhaps 60,000 humans left to carry on the species. This is pretty standard fare in the genre, but what makes this different is that the aliens are not actively in attack mode; the mothership has moved on. But they have left a caretaker force, so humans cannot merely go about their efforts to repopulate the planet. When you throw in a gaming aspect, the book stands alone in the plot and storyline. It is unique and rather compelling. The story revolves around a group of less than a thousand people living in an underground complex simply labeled A3. As increased radiation starts taking its toll on the people, four people try a new approach, beyond the physical realm as we know it in order to keep the substance of humanity alive. Overall, the book is well-written. The character voices are appropriate and believable. One particular shift in the voice was quite well done—we didn’t need to have it explained when one character had a significant life-altering experience. We could read it in his voice. The action scenes were well-developed and painted a good picture of what was happening. Editing was good. There were no big problems in either copy editing or proofreading that interrupted the flow of the story. The reader is pulled along for the ride. The ending left me hanging a bit. I would have liked to see a more conclusive reason for the end of the book, but it certainly left me wanting to buy the next volume. I have a vested interest now in the story, and I want to see what happens next. Kyrathaba Rising is a taut, well-written novel. What I liked most of all, though, is that it is unique. The author has explored new ground, taking at least three genres and intertwining them together into an exciting new tale of danger, hope, and resilience. I look forward to the sequel. 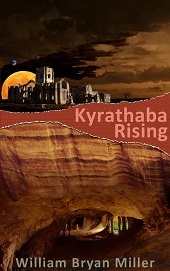 For more reviews or to buy Kyrathaba Rising from Amazon.com, click here.